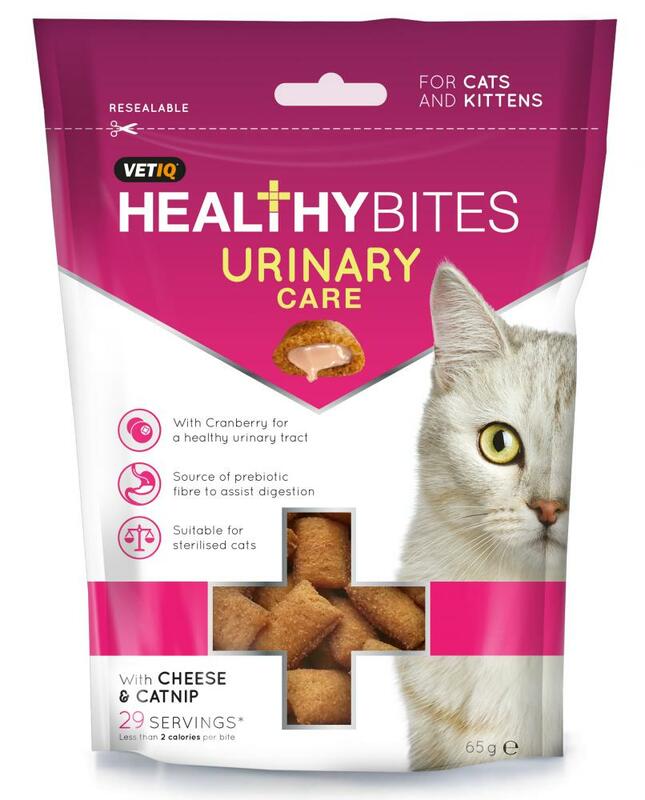 Healthy Bites Urinary Care comprise of a crispy cereal shell with a health enhancing cream filled centre packed with amino acids (L-Carnitine, DL-Methionine), vitamins (E, A & D), antioxidants, essential fatty acids (Omega-3 & 6) and plant extracts (Yucca schigidera) to help support a healthy urinary tract and immune system. These highly palatable bites are approved by veterinarians and have no artificial colours, flavours or preservatives and are wheat free too. Meat & Animal Derivatives, Cereals, Oils & Fats (Omega-3 fatty acid 1.7%, Omega-6 fatty acid 4%), Derivatives of Vegetable Origin (Yucca Schidigera 1%, Inulin 0.3%), Milk & Milk Derivatives (Cheese 4%), Fruit (Dried Cranberry 4%), Minerals. Flavouring. Natural Antioxidant. Natural Colourant. Nutritional additives: DL-Methionine 9930 mg, L-Carnitine 1750 mg, Taurine 930 mg, Vitamin C 750 mg, Vitamin E (RRR alpha tocopherol) 79 mg, Vitamin A 1400 IU, Vitamin D3 210 IU.Rosemary Extract. Crude Protein 28.9%, Crude Oils & Fats 22.7%, Crude Fibre 3.9%, Crude Ash 6.2%, Moisture 8.3%, Calcium 1.1%, Phosphorus 0.8%. Poultry Meal, Rye Flour, Canola Oil, Maize, Flavouring, Milk Derivatives, Dried Cranberry, Sodium Chloride, DL-Methionine, Inulin, Yucca Schidigera, Natural Colourant, L-Carnitine, Taurine, Vitamin C, Rosemary Extract, 6-Palmityl-L-Ascorbic Acid, Vitamin E (RRR alpha tocopherol), Vitamin A, Vitamin D3. Crude Protein (min) 28.1%, Crude Fat (min) 20.4%, Crude Fibre (max) 4.4%, Moisture (max) 9.3%, Ash (max) 6.8%, Calcium (min) 1.0%, Phosphorus (min) 0.7%. Feed at any time of the day as a treat or reward. 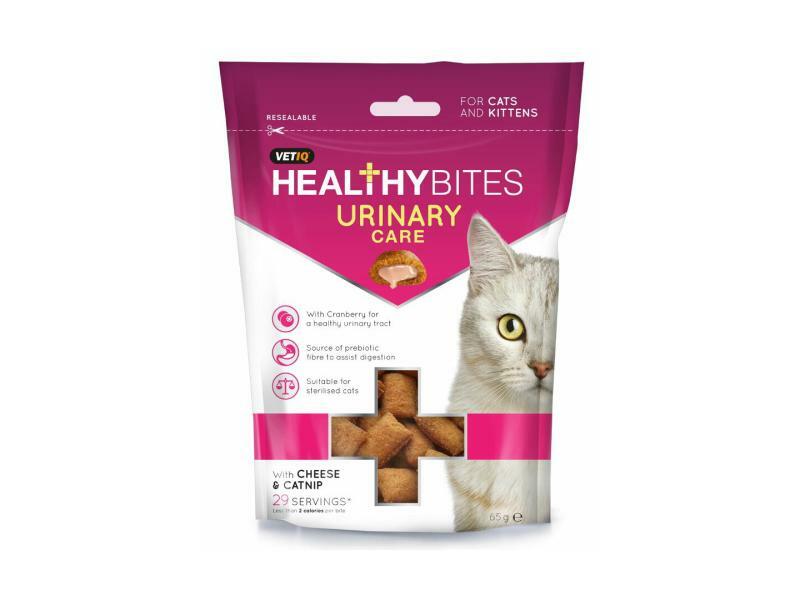 Below are some recent questions we've received regarding VETIQ Healthy Bites Urinary Care Bites for Cats, including answers from our team. Our cat has chronic kidney disease, he is happy and otherwise healthy. Would VETIQ be safe for him? These treats should be fine so long as you don't overfeed them. A high protein diet is bad for cats with renal disease as they struggle to metabolise the bi-products of protein metabolism. These treats have a medium-high protein content. Something like Harringtons cat treats are a bit lower in protein. Definitely avoid the treats such as chicken and duck that have 40-50% protein content. Hope this helps? What age kitten is this suitable for? My kitten is 6 weeks old and has been to the vets and diagnosed with a suspected minor UTI - he is on antibiotics but if there is anything I can give him to help -in terms of food etc I would be happy to do so. I would like to give him these bites - is this suitable for his age? This product is fine to give to a 6 week old kitten as long as it only makes up a small portion of the diet. Less than about 10% by weight would be my suggestion. The main diet should be a good quality and well balanced diet with a high meat or fish content.